Milverton Mennonite Fellowship began in 1982 as an outreach of the Western Ontario Mennonite Conference in the town of Milverton, Ontario, Canada. Many of the conference's churches were located in the countryside, and it believed a "town" church would have appeal to persons in that community. Initially services were held in the basement of the Anglican Church. Then for a number of years the growing congregation rented space above the former Milverton Sun newspaper office. In the late 1980s even this space was too limited and the group met in the public school auditorium. A new building was erected on the northern edge of town in 1992. Harold Shantz was the founding pastor of the congregation. Important parts of the worship life have been music and the sharing time. The congregation began to use a cell church model in 1990s. Barker, Helen. "Small congregation that grew, building new Mennonite church near Milverton." Undated news clipping, ca. 1990. CMC Nexus (November 1995): 6. Mennonite Reporter (21 January 1985): 12; (5 February 1990): 14; (4 March 1991): 13; (18 May 1992): 17; (19 October 1992): 15; (6 February 1995): 3. Steiner, Sam. "Milverton Mennonite Fellowship (Milverton, Ontario, Canada)." Global Anabaptist Mennonite Encyclopedia Online. January 2017. Web. 26 Apr 2019. http://gameo.org/index.php?title=Milverton_Mennonite_Fellowship_(Milverton,_Ontario,_Canada)&oldid=143124. Steiner, Sam. (January 2017). 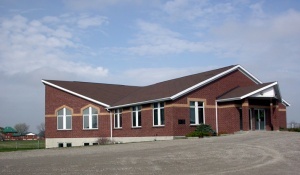 Milverton Mennonite Fellowship (Milverton, Ontario, Canada). Global Anabaptist Mennonite Encyclopedia Online. Retrieved 26 April 2019, from http://gameo.org/index.php?title=Milverton_Mennonite_Fellowship_(Milverton,_Ontario,_Canada)&oldid=143124. This page was last modified on 13 January 2017, at 19:23.